greenlightgo - I love your addition to cupcakeguru's towel! The tombstone is awesome! I love the new addition to the Halloween towel! That tombstone rocks! That is such a fun towel. This is hard for me to send. Seriously. It's not enough. I don't know. This was such a hard one for me, I had a crazy work week (80 hours. Jeez) and I read the song lyrics over and over. I think my brain was fried. As a former smoker, I know how fabulous it is to take a moment of solace and to be alone with your thoughts while smoking. I wanted to convey the feeling of alone. I might be a person who likes color too much and can't handle 4 colors being on a towel. LOL. 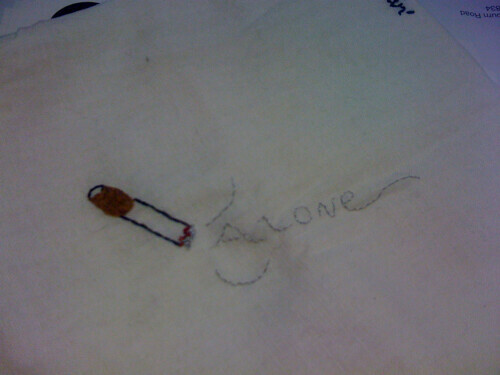 I made myself feel better by doing metallic french knots for the ashes and lit part of the cigarette. And this now concludes Mamaphunk's weirdo therapy post in the middle of the tea towel gallery. I have gotten behind on commenting. I have come and looked and then do not have time to comment. Everyting is looking great I can not believe how fast the towels are coming along. ritapizza -that pink scooter is great. My mom has a pink scooter too! greenlightgo - cute design. I love the use of the glow in the dark thread. I would love to see it in person. 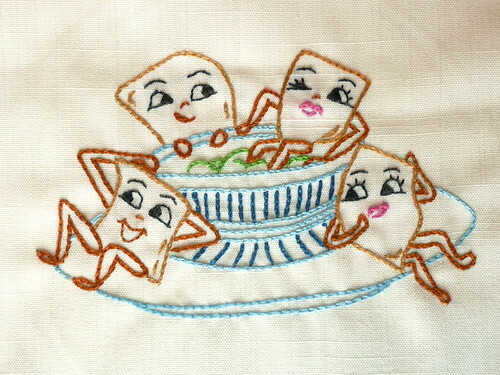 This stitching is so inspiring! These chip guys are so cute! They're so flirty and delicious! I love guacamole! Thanks, Susie! Mamaphunk- You did a great job! I would have seriously struggled using song lyrics too. A nice simple approach. Those chips are adorable. I've thought about doing that design for ages! That chip design is HILARIOUS! Seriously, I laughed out loud. Great choice, Susie! IamSusie - those chips are great. Makes you feel bad eating them. Awesome stuff guys! Like I would expect anything else from you guys! beaded snowdrop pendant now with tutorial!